Just a tip about the Small Grommets in the Occasions Mini Catalog. The catalog suggests that you set the Small Grommets with a Crop-a-Dile, PLEASE DO NOT do this to set them. They actually stick into your Crop-a-Dile. Instead place the foam from your Mat Pack under your paper, and push your grommet through the paper, then use your bone folder to push back the legs of the grommet. 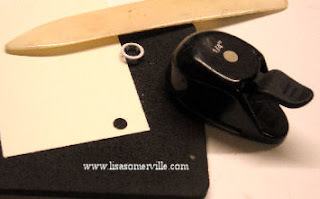 If you are wanting to thread ribbon through the center - first punch a 1/4" hole then push your grommet into your paper, then bend back the legs with a bone folder. I wonder why S.U. didn't figute this one out before putting it into their mini catalog. Maybe they wanted to sell mor C.A.D.s? Thanks for the tip. I found it on the SU! demo website. But, wanted to let you know how much it's appreciated.